Membership - Valuentum Securities Inc.
Sign Up Today. First 14 days FREE! At Valuentum (val∙u∙n∙tum) [val-yoo-en-tuh-m], we strive to stand out from the crowd. Most investment research publishers fall into a few camps, whether it be value, growth, income, momentum, chartist or some variant of the aforementioned. We think each in its own right holds merit, but the combination of these approaches is even more powerful. After all, stock price movements aren’t just driven by investors of the value or growth variety, but by all market participants. Therefore, we look at stocks from a variety of investment perspectives in order to better understand and capitalize on opportunities. We want to provide our clients and subscribers with relevant information. Though the breadth of our analysis is large, the core of our process centers on in-depth discounted cash flow analysis and the concept of a margin of safety (invented by Benjamin Graham and embraced by Warren Buffett and Valuentum). In our 16-page stock reports, we offer a fair value estimate for each company and assess the attractiveness of the firm's valuation based on its respective margin of safety. We also provide a relative valuation assessment in the context of the firm’s industry and peers. A cross section of our ValueCreation and ValueRisk ratings provides a financial assessment of a company’s business quality and competitive advantages, while our ValueTrend and Economic Castle ratings offer insight into the trajectory of a firm’s economic profit creation (ROIC versus WACC). Our analysis doesn’t stop there. We offer a technical evaluation of the stock as well as an assessment of other momentum indicators. We not only want to reveal to investors which firms are undervalued (both on a discounted cash flow and relative value basis), in our view, but we also want to provide investors with the information needed to anticipate entry and exit points. Most investment research publishers focus on arriving at a target price or fair value estimate, but fall short of providing a technical or momentum assessment to bolster buy and sell disciplines. We go the distance and strive to provide investors with answers--not half the story. An explanation of our approach would not be complete if we didn’t describe our ideal stock idea. We’re looking for companies that are undervalued--both on a discounted cash flow basis and versus peers--have strong growth potential, have a solid track record of creating economic profits for shareholders with reasonable risk, are strong cash flow generators, have manageable financial leverage, and are currently showing bullish technical and momentum indicators. These firms typically score a 9 or 10 on the Valuentum Buying Index, our stock-selection methodology. 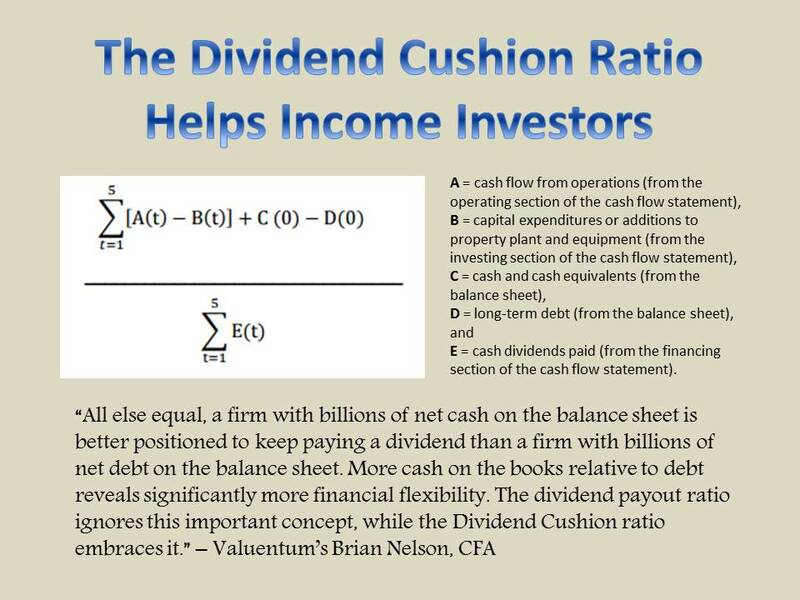 We also provide dividend reports and calculate a company's forward-looking, cash-flow based measure of dividend health, the Dividend Cushion ratio, to offer a unique picture of the investment opportunity, from value through momentum! Become a member of Valuentum to gain access to our premium commentary, including our 16-page stock and dividend reports. 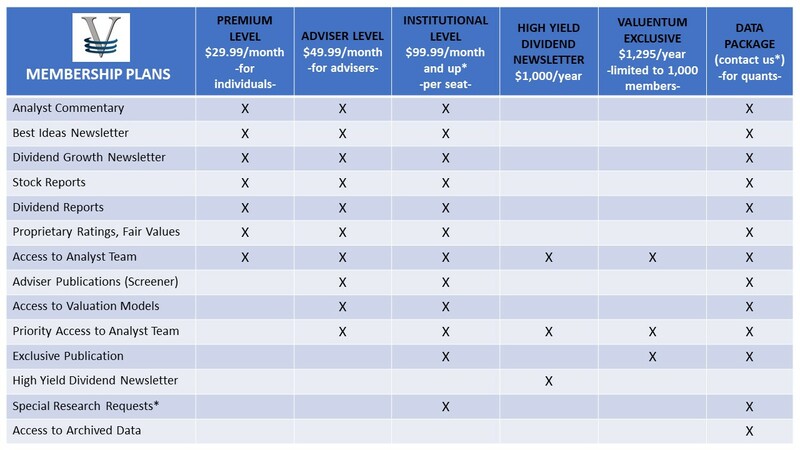 The premium plan offers complete access to our website and includes both the Best Ideas Newsletter and Dividend Growth Newsletter (each delivered monthly). These newsletters showcase how we put the fair value estimate, fair value range, Valuentum Buying Index, and Dividend Cushion ratio, among other metrics, into practice. Please see more details about Valuentum's subscription plans below. Please also don't forget about the High Yield Dividend Newsletter or the Nelson Exclusive publication, valuable add-on features to any membership. If you are a financial adviser and would like to learn more about how we can help your practice, please click here. If you would like to use our services in an institutional setting, please contact a sales representative to find out how we can help. If you are not happy with our service, cancel within 14 days of the start date by emailing info@valuentum.com. You will not be charged anything. After the first 14 days, you may cancel at any time, and we will recalculate the cost of the subscription for the period the subscription was used (at current applicable monthly rates) and will refund any difference less transaction fees. No refunds are provided for monthly subscriptions. Your complete satisfaction is our top priority. Sign Up to Receive Our Best Ideas Newsletter! As part of your subscription to Valuentum, you will receive in your inbox on the 15th of each month our monthly Best Ideas Newsletter (in pdf format), which reveals our best ideas for capital appreciation potential constructed in a portfolio. This portfolio of best ideas may contain long positions as well as put and call options. In the Best Ideas Newsletter, we write commentary associated with the companies in the portfolio and on stocks in the news, and notify you immediately via email if our thoughts or opinions have changed on any company or position. We send you notification emails, so you don't miss a beat. Consistent with our investment methodology, the Valuentum Buying Index, the best ideas in the Best Ideas Newsletter portfolio may span investing disciplines, market capitalizations and asset classes. Very few newsletters apply a time-tested (yet innovative) process and embrace transparency. We can proudly say that we are among the few. Past results are not a guarantee of future performance. Click here to subscribe now and receive the next edition of our monthly Best Ideas Newsletter in your inbox and gain access to all premium commentary on our site. Below we outline a few very brief summaries of ideas that we currently include in the Best Ideas Newsletter portfolio. Please note that these are just a few examples, and the Best Ideas Newsletter showcases many more ideas with each and every monthly edition. Join Today! 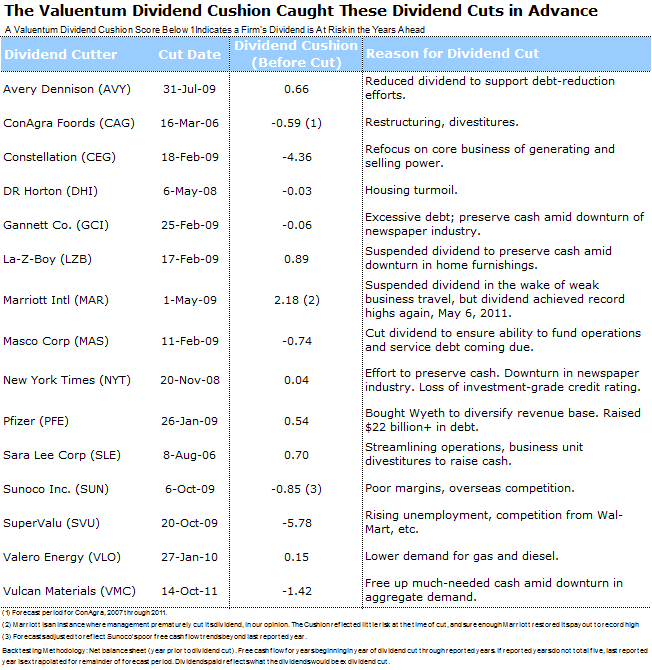 At Valuentum, we often use a discounted cash-flow model as a means to back into the current share price of firms in order to ascertain whether the market is unfairly pricing their stock relative to reasonable long-term growth and profitability assumptions. In Apple's case, we believe the market is merely pricing in inflation-like expansion beginning toward the latter end of this decade. Although in the land of technology, competition adapts quickly and a few years from now can be viewed as the distant future, we think the iPhone-maker represents a compelling risk-reward opportunity at current levels based on our analysis. 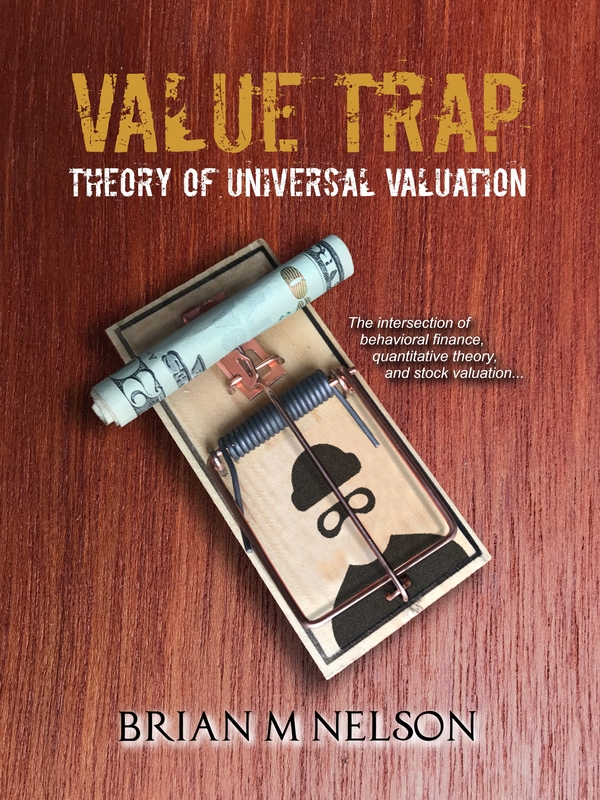 Often, evaluating a firm via a discounted cash-flow model and re-engineering its stock price can provide a better understanding of a company's investment potential on a risk-reward basis than even the most clearly written prose. Booking, formerly called Priceline, is probably one of the best more-recent examples of the Valuentum Buying Index in practice. Registering a pristine 10 in February 2015, the stock now has been a strong winner in the portfolio of the Best Ideas Newsletter. The online travel giant continues to generate substantial free cash flow as it grows at an impressive rate, and we love its net cash position, inclusive of long-term investments. Management's comments have also been quite reassuring to the pace of global economic resilience. International business accounts for ~90% of Priceline's gross bookings, with the US making up the balance. Such a cash-rich business eases our concerns with the risk involved in holding an entity so sensitive to the economic cycle at this mature point in the global economy’s expansion. Shares continue to have some room to run based on the upper bound of our fair value estimate range. Booking's virtuous cycle is firmly intact and represents one of the strongest competitive advantages a company could ever have. Strong partner relationships allow it to provide top-notch property selection, an enhanced customer experience helps drive increased conversion and traffic, while increased traffic allows it to further improve the customer experience and partner satisfaction. It’s hard to find anything wrong with Visa’s business model. The company offers a secure, payment network that is accepted virtually everywhere in the United States. The firm makes money every time a Visa user swipes his or her debit or credit card. Unlike rivals, Discover and American Express, Visa doesn't hold customer credit risk. Visa benefits from two fantastic competitive advantages: a network effect and costly initial investment. The network effect is incredibly strong for Visa. As of its last update, the firm has more than 3.1 billion cards outstanding accepted by retailers across the world. The number is significantly higher than the number of Mastercards and many times the number of American Express cards outstanding. This network effect took years, as well as billions of dollars to create—something that won’t easily be replicated by any new entrant. Most importantly, Visa generates incredible operating margins in the 60% range, leading to large levels of free cash flow generation. The company continues to possess valuation upside and is one of the most shareholder-friendly companies in our coverage universe. Sign Up for More Best Ideas!